The 2014 Volkswagen Jetta Sportwagen has no new changes. The 2014 Volkswagen Jetta Sportwagen presents a versatile silhouette that reflects its European upbringing. Clean lines combine with understated curves to create a unique, streamlined station wagon silhouette, while the simple front façade adds a very Volkswagen touch. A turbocharged 2.0-liter diesel four-cylinder engine is key in powering the 2014 Sportwagen TDI, churning out a healthy 140 horsepower and 236 lb-ft of torque. A standard six-speed manual transmission is offered, along with an optional six-speed automated manual option, which is called DSG. EPA-estimated fuel efficiency for this diesel powertrain comes in at an outstanding 34 mpg combined for the manual transmission and a still amazing 33 combined for the DSG. 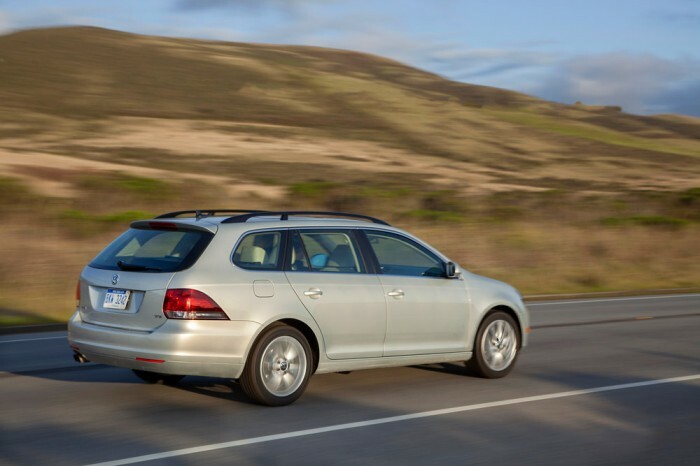 For the 2014 model year, the Sportwagen has one of the best cabins in its class, using high-quality materials, soft-touch surfaces, and attention to detail to make a decidedly upscale interior. The center console armrest adjusts to the proper height for both passengers and drivers alike, while the rear seat air vents make sure everyone is comfortable. There is plenty of room for passengers and cargo, with a decent amount of legroom in the back seat. The Insurance Institute for Highway Safety awarded the 2014 Sportwagen their top top rating of “Good” in the moderate-overlap, side-impact, and roof-strength tests. Antilock disc brakes, stability and traction control, front sead side-impact airbags, and full-length side curtain airbags are all standard safety features on the TDI along with a rearview camera, which is not available on the traditionally powered models.